These labels are our livelihood, so we want you to enjoy using our products as much as we enjoy making them for you. If for any reason you are unhappy with your purchase, please contact us within 30 days of your purchase date and we'll provide a replacement set. Or if we've made an error on your order, just let us know; we'd be happy to make it right as quickly as possible. Please keep in mind that all personalized product is made-to-order -- specifically for you -- from scratch; therefore, it is non-returnable and non-refundable. Canceled, refused or returned orders that have been printed are subject to a 15% service fee, and shipping fees are non-refundable. Please note: we cannot replace waterproof labels that have faded in color due to exposure to chlorine bleach. Please make sure your detergent is chlorine bleach-free before washing your labels in the dishwasher. Read the fine print on your detergent bottle/carton, review our notices posted in each listing and heed the warning label placed on each set of waterproof labels. 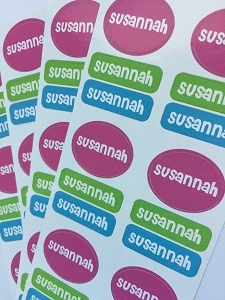 With proper care, our vinyl labels can last indefinitely. We copy and paste personalization direct from each order to help prevent spelling errors. It is very important to type the personalization correctly and double-check all spelling before placing an order. Cherry Hill Designs cannot be held responsible if the order information given to us is incorrect. However, if we have made an error, we will promptly reprint the item and ship it to you at no charge.